I had no idea what to expect from this animated feature, and to be honest , I thought the trailer was lame. So it’s with a great sense of relief and delight that I offer an enthusiastic review of “The Croods”. It has a neat premise and often breathtaking execution. What’s more, if you want to see a truly effective and creative use of 3D, run to the nearest theatre and watch it on the big screen. The folks at Dreamworks know what they’re doing when it comes to 3D and they have crafted yet another enjoyable feature for the whole family. 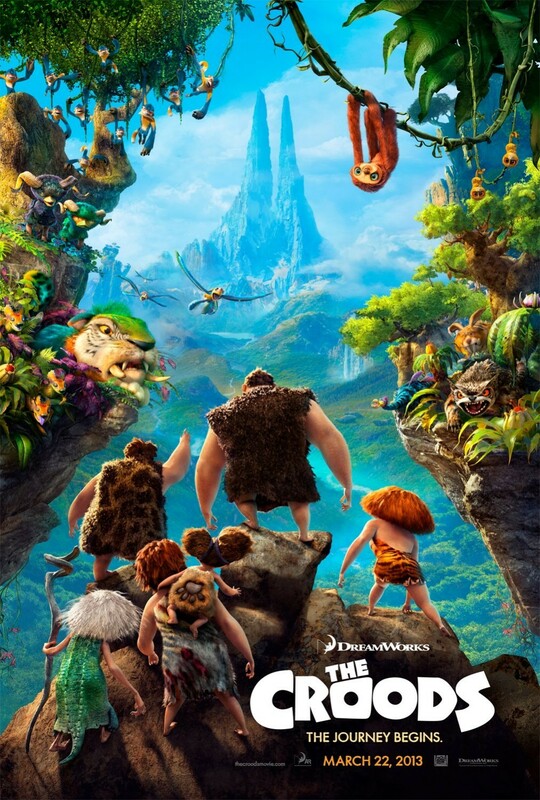 The movie follows The Croods family (obviously) during pre-historic times. The teenage daughter Eep, doesn’t get along with her overprotective father, Grug. The man is intent on keeping Eep and the rest of his family safe in their cave. His excuse: “Curiosity and exploration are bad”. But Eep sneaks out one night and encounters a young stranger, Guy who tells her that the world is coming to an end. With excellent voice work by Nicolas Cage, Emma Stone, Ryan Reynolds and Katherine Keener, “The Croods” offers sunny entertainment with a light but palatable “message” about the importance of family. More important, the film stays true to its goal of upbeat entertainment. At the screening I attended, and for 90 minutes, kids and adults were laughing and cheering. That’s always a sign of an instant hit.